In macular pucker, a type of scar tissue forms as a film over the center of vision which is called the macula, distorting it. The condition is also frequently termed epiretinal membrane. 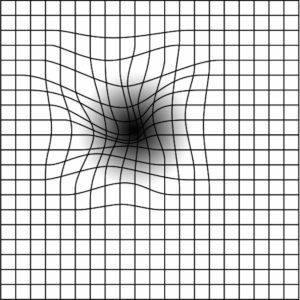 The distortion of the macula caused by the epiretinal membrane results in a corresponding distortion in vision. Objects often appear to be distorted, with those having a straight edge appearing to have a kink or a bend in the straight edge. Sometimes this distortion is so severe as to make it difficult to see with both eyes simultaneously, forcing the patient to try to keep one eye closed to avoid the mismatch of images. The other principal symptoms is blurring of vision, particularly noticeable when attempting to read fine print. Sometimes the blurring can be sufficiently severe to reduce the vision to below 20/200, the level of legal blindness. What Conditions Can Be Associated With Macular Pucker? In about half of the cases in which this condition is diagnosed, it is associated with some other condition in the eye. The most frequent condition is retinal tear or detachment. The next most frequent condition is a retinal vein occlusion, a type of “mini-stroke” of the retina. In the other half of patients, no associated condition can be found. Most of these latter patients are elderly, usually older than the age of 60, and it is thought that age itself may have something to do with the condition. Is Macular Pucker Related to Macular Degeneration? It is very important that patients realize that this condition is very different from age-related macular degeneration. Specifically, it has a much better prognosis, even if left untreated. It is relatively unusual for it to involve the second eye, and most of the mild cases never progress. Self peeling of an epiretinal membrane. Studies have shown that roughly 75% of eyes with epiretinal membrane have no further deterioration of vision after the condition is first diagnosed. The other 25% do have some worsening of vision, this occasionally is enough that surgery is needed. A rare (1%) patient will have some spontaneous improvement in vision, when the membrane peels itself (see Figure). The only therapy for macular pucker (epiretinal membrane) is a type of surgery called vitrectomy. This procedure was developed about 40 years ago, and has been continuously improved since then. In this surgery, small holes are made in the white of the eye on either side of the iris, and instruments having the width of a pencil lead (0.7 mm) are introduced into the eye. Using fiberoptic illumination system, the fine instrument is guided back to the back of the eye, the scar tissue is engaged by the instrument and peeled from the back of the eye. Patients who have undergone this surgery characterize it as being relatively non-painful. It is usually done under local anesthesia, with the patient sedated to avoid the discomfort of being aware of the surgery taking place and also to minimize any movements. Vitrectomy for epiretinal membrane is usually performed in an outpatient surgical center, with the patient going home after surgery. Click here to watch a video for macular pucker surgery. After the membrane is removed, the visual improvement takes place gradually over a couple of months. The ultimate visual acuity is usually evident by 3 months after surgery, although occasionally it takes longer. The patient gradually notices improvement in distortion and clarity of vision. The improvement can be substantial, but only rarely is it total. The average patient recovers one-half to two-thirds of normal vision. All surgery has risks, but the risks of vitrectomy for epiretinal membrane have become very low. The principal risk is formation of a retinal detachment. The risk is about 1 in 100, and often can be detected and repaired at the time of surgery. Sometimes it is not detected until later, and then a second operation might be needed. The other major problem after surgery is infection, which is very rare. The risk is about 1 in 2,000, but if this were to occur, it could conceivably cause loss of the eye if the symptoms were not promptly reported and treated. Even in this complication, vision can usually be salvaged in the vast majority of cases if treatment is prompt. Finally, a number of patients who have undergone surgery for macular pucker later need cataract surgery. If this is to occur, it usually occurs a year or so later. It is not clear how this is connected to the surgery but it does appear to occur more commonly after it than would otherwise be expected. The decision about whether an individual patient’s eye needs surgery is primarily based on symptoms. Some patients tolerate the blurring and distortion from an epiretinal membrane surprisingly well. In other patients, even a small amount of blurring and distortion cause them a great distress. One other feature needs to be considered in making the decision about when to perform surgery. There is a tendency for less recovery of vision if the decision about surgery is delayed for a long time. A delay of a few weeks is not thought to cause much decrease in results, but a delay of many months might.